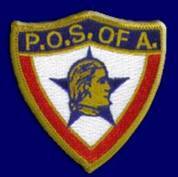 The Patriotic Order, Sons of America (the name appears with and without the comma) was, like many organizations with “Patriotic” in their title, an anti-Catholic, anti-immigration Know-Nothing society. It originated as the Patriotic Order, United Sons of America at some time prior to 1847 in Philadelphia. The order disappeared with the collapse of the Know-Nothing Party, but was resuscitated in 1868, this time minus the epithet “United.” The degrees were Red, White, and Blue, and the women’s auxiliary was the (Patriotic) Daughters of America. The Patriotic Order, Junior Sons of America was founded as the junior branch in 1847, and the Patriotic Order of True Americans was the result of a merger between the Patriotic Order of Americans (another auxiliary) and the Daughters of America. There was even (according to the Philadelphia Public Ledger of September 1, 1923) a “fun” or “mummers” division of the Patriotic Order, Sons of America, called the Rough Riders. The order is still active.